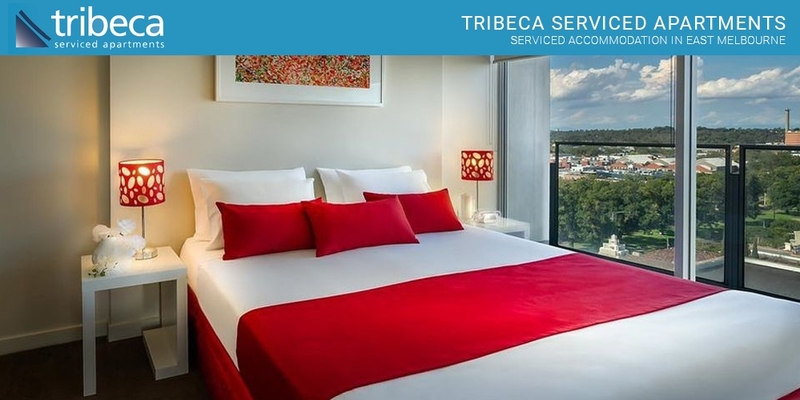 Tribeca Serviced Apartments - PH : (03) 9412 2100 Book Direct 2 Save. Modern, contemporary 4.5 star apartments featuring stainless steel kitchens,balconies, on site supermarket and restaurant. Private laundry. ADVANCE PURCHASE bookings are NON-REFUNDABLE even if cancelled or no-show, FULL AMOUNT will be charged. Modern, contemporary two bedroom apartments featuring stainless steel kitchens, private laundries balconies,king or twin bedrooms. Onsite supermarket and cafes etc. Modern, contemporary two bedroom apartments featuring stainless steel kitchens, private laundries balconies,king or twin bedrooms. Onsite supermarket and cafes etc. Rates are for Minimum of 3 Nights stay. Modern, contemporary two bedroom apartments featuring stainless steel kitchens, private laundries balconies,king or twin bedrooms. Onsite supermarket and cafes etc. Rates are for Minimum of 5 Nights stay. Modern, contemporary two bedroom apartments featuring stainless steel kitchens, private laundries balconies,king or twin bedrooms. Onsite supermarket and cafes etc. Rates are for Minimum of 14 Nights stay. Modern, contemporary two bedroom apartments featuring stainless steel kitchens, private laundries balconies,king or twin bedrooms. Onsite supermarket and cafes etc. Rates are for Minimum of 28 Nights stay. Modern, contemporary two bedroom apartments featuring stainless steel kitchens, private laundries balconies,king or twin bedrooms. Onsite supermarket and cafes etc. These two bedroom apartments are truly unique. They provide large living spaces and can accommodate up to six people if required. The kitchen features stainless steel bench tops. The bedrooms can convert to either twin or king bedding, and the living room has a double sofa bed to accommodate an additional two persons. Rates are for 4 guests. Rates are for Minimum 3 Nights Stay. These two bedroom apartments are truly unique. They provide large living spaces and can accommodate up to six people if required. The kitchen features stainless steel bench tops. The bedrooms can convert to either twin or king bedding, and the living room has a double sofa bed to accommodate an additional two persons. Rates are for 4 guests. The warehouse style serviced apartments are punctuated with dramatic red textures and polished finishes will transform your stay to a new level of sophistication. At Tribeca you don't need to travel far to stock your kitchen with an IGA supermarket located within our complex. If you don't wish to cook, try the culinary delights of the cafes and restaurants on site, then you can work off your indulgences in the 20 metre lap pool and gymnasium*. After Hours : Please contact the property for check in procedures if arriving after 5:30pm on weeknights, after 5pm on Saturday and Sunday. Car Parking : Secure undercover parking is available at $18 per day. Please request this is the comments section to guarantee a car space. Getting There : Airport Sky Bus Shuttle will pick you up at the airport and bring you to our door. CHARGES APPLY. Trams stop outside the Tribeca building on Victoria Parade. Tribeca Serviced Apartments is ideally located to access some of Melbourne's premier attractions. We are within walking distance to the CBD, MCG, Rod Laver Arena, Vodaphone Arena, Olympic Park, Bridge Road Shopping Precinct, sporting outlets, warehouses, restaurants, bars, cafes and theatres.